Bullseye Metals 1/4 .250 Steel Plate 8" x 12" Flat Bar Mild Steel! 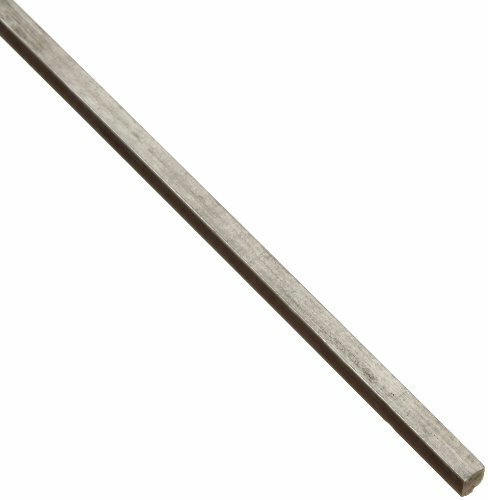 1095 Steel barstock for forging and Knife Making 3/16" x 1-1/2" x 12"
The carbon steel key stock has an unpolished (mill) surface, meets American Society for Testing and Materials International ASTM A108 specifications, and has a standard tolerance. The carbon steel grade provides a good balance of toughness, strength, and machinability. It is magnetic. 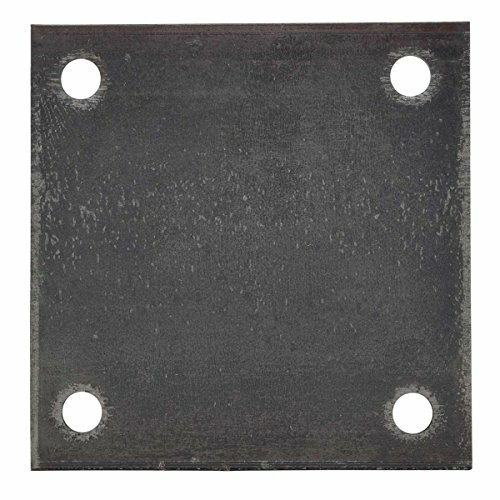 This listing is for one steel plate with Free Shipping! We do custom CNC plate cutting. +- 1/8 tollerace should be expected. We appreciate your business and do our best to give you the best possible product. The carbon steel key stock has a zinc-plated finish, meets American Society for Testing and Materials International ASTM A108 specifications, and has an oversized tolerance. The carbon steel grade provides a good balance of toughness, strength, and machinability. It is magnetic. The zinc plating provides corrosion resistance and a smooth, reflective appearance. The key stock has an oversized tolerance, which makes it slightly larger than the listed size and provides a tight fit in a keyway. The steel key stock has a gold dichromate finish, meets Deutsches Institut f r Normung DIN 6880 and British Standards BS 4235 specifications, and has a standard tolerance. The steel material provides a good balance of toughness, strength, and machinability. It is magnetic. The gold dichromate finish provides corrosion resistance and a gold appearance. 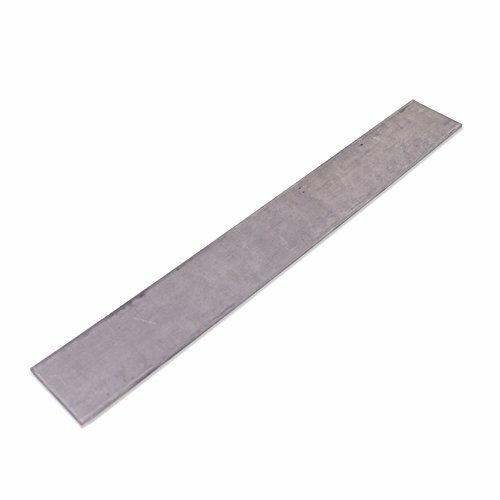 The A36 carbon steel rectangular bar has been hot rolled, has an unpolished (mill) surface, meets American Society for Testing and Materials International ASTM A36 specifications, and has a standard tolerance. The A36 carbon steel grade is a structural steel that has better formability than 1018 carbon steel. The bar has been hot rolled, a method of compressing metal between two rollers at a temperature above the material's recrystallization temperature to attain the specified dimensions. The 1018 carbon steel rectangular bar has been cold finished, has an unpolished (mill) surface, meets American Society for Testing and Materials International ASTM A108 specifications, and has a standard tolerance. The 1018 carbon steel grade has low carbon content for a balance of strength, machinability, formability, and weldability. This material can be heat treated for higher hardness. The bar has been cold finished, a process of removing the outer layer to achieve the specified dimensions. The bar has been annealed, a method of heating and cooling metal to modify its properties, such as increasing its formability and toughness or decreasing its strength, after it has been shaped. The O1 tool steel rectangular bar has been precision ground, meets American Society for Testing and Materials International ASTM A681 and Society of Automotive Engineers SAE J437 specifications, and has a standard tolerance. The O1 tool steel grade has better machinability than A2 tool steel. It must be hardened in oil, which can be done at relatively low temperatures for good dimensional stability. The bar has been ground to achieve the precise shape and size. 1095 forging steel is an ideal steel for knife making as well as many other metal smith type hobbies. 195 steel is a high carbon steel that is very easy to shape through a process called forging. This steel lacks some of the manganese of other steels and as such has a lower harden-ability. The added carbon creates a carbon rich martensite with plenty of free carbon for good abrasion resistance. This steel required more care in the heat treatment process. Also, avoid lamellar annealing and overheating with this steel. Recommended working sequence for 1095: Forging: Heat to 2100 degrees Fahrenheit / 1150 Celsius. Do not forge below 1500 degrees Fahrenheit / 815 degrees Celsius. Normalizing - Heat to 1575 Celsius & then cool in still air. Annealing - heat to 1475 degrees Fahrenheit & furnace cool to 1200 degrees Fahrenheit at a rate not exceeding 50 degrees Fahrenheit per hour. Grinding Or Machining: Hardening - Austenitize heat to 1475 degrees Fahrenheit. 1095 forging steel is cold rolled & annealed with a bright finish which makes it perfect for forging, blades, tools & other parts. 1095 has a carbon content of .95% which makes makes this a hard steel that will reduce the amount of wear that a blade will experience over time. 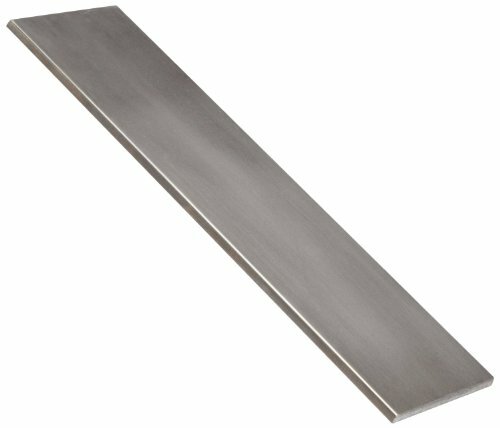 When used to make knives, 1095 steel holds a great edge and is a very easy steel to sharpen. This steel is perfect for knives that will not be formed and made too thin & is ideal for chopping knives, functional show swords, replica blades as well as daggers. 1095 forging steel is also a very useful metal for making a number of dining tools & is often the metal of choice when making machetes. Bullseye Metals 11 GA 1/8 Steel Plate 6" x 12" Flat Bar 11 Gauge Steel! 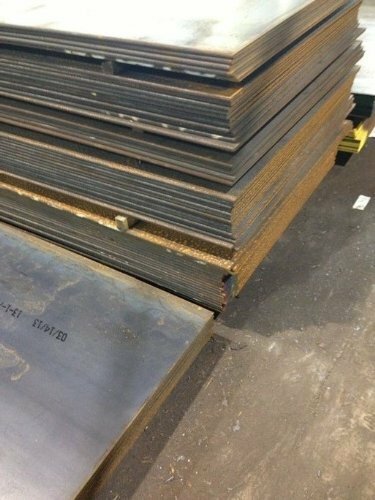 Bullseye Metals 1/4 .250 Steel Plate 4" x 8" x 1/4 Flat Bar Mild Steel! The term "cold rolled" referrs to the milling process of the steel. The steel is processed at cool temperatures and yields a clean mill finish with close dimensional tolerances. 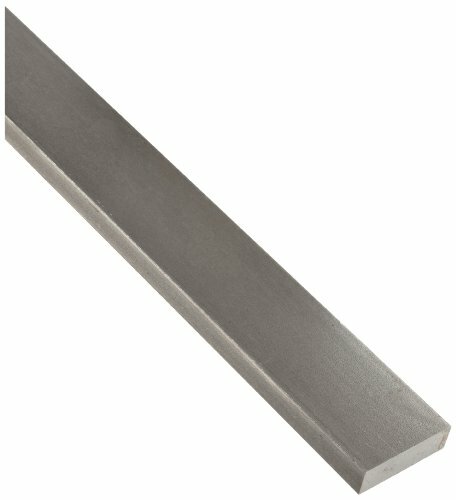 D2 Steel Barstock for Knife Making -- 3/16" x 1-1/2" x 12"
D2 is considered a "semi-stainless" because it has more carbon and less chromium than most stainless steels. As such, it is difficult to attain a high mirror polish, keeps an edge better than most stainless steels, but also is less susceptible to rusting like 1080 or 1095. Our D2 contains 12% chromium, 1.5% carbon, 1.2% molybdenum, 1% cobalt, 1% vanadium, and less than 1% sulphur, silicon, manganese, and phosphorus. D2 is an air quenching steel. D2 is a "semi-stainless" air quenching steel with higher carbon and less chromium than "traditional" stainless, but keeps an edge better and hardens up to around RC 62. Iron alloy contains 12% chromium, 1.5% carbon, 1.2% molybdenum, 1% cobalt, 1% vanadium, and less than 1% sulphur, silicon, manganese, and phosphorus. Dimensions are 5/32 x 1-1/2 x 12. This steel is annealed. It's superior hardening and decent rust resistance makes D2 a good steel to make into tools. Bullseye Metals 3/16 .188 Steel Plate 8" x 12" Flat Bar! For custom sizes email: csr@jfazzio.com 6" X 6" Square 1/4" (0.250") Thick (4) 9/16" (0.563") Holes for 1/2" Bolts Weldable unpainted mill finish A36 steel base plate with holes Fabricated from hot rolled A36 flat bar Custom made structural steel base plates and flanges More options at www.shopjfi.com ShopJFI (Joseph Fazzio Inc) offers a wide range of custom fabricated structural steel and metals. 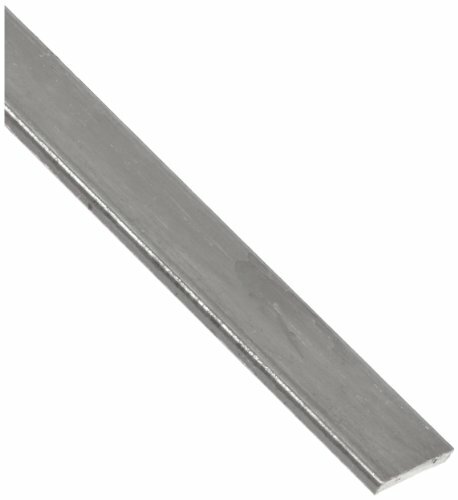 D2 Steel Barstock for Knife Making -- 1/8" x 1-1/2" x 12"
Dimensions are 1/8 x 1-1/2 x 12. This steel is annealed. 1095 Forging Steel Barstock for Knife Making -- 3/16" x 1-1/2" x 12"
1095 is a moderately high carbon forging steel, in the annealed state. 1.0% carbon, 0.90% manganese, 0.05% sulphur, and 0.04% phosphorus. Layer with 15N20 to make Damascus style blades. Heat treating is recommended to harden your blade for regular use. 10 is an oil quenching steel. NOTE ON SHIPPING: All orders are shipped USPS Priority (2-3 business day) or UPS Ground (depending on weight), with a tracking number. Amazon automatically combines shipping cost by weight when ordering multiple items from our store at the same time, saving you money! 1095 is a moderately high carbon content forging steel used for making knives. This oil quenching steel is in the annealed state. Iron alloy contains 1.0% carbon, 0.90% manganese, 0.05% sulphur, and 0.04% phosphorus. Dimensions are 3/16 x 1-1/2 x 12. Layer 1095 with 15N20 to forge Damascus, and etch with Ferric Chloride to bring out the contrast. 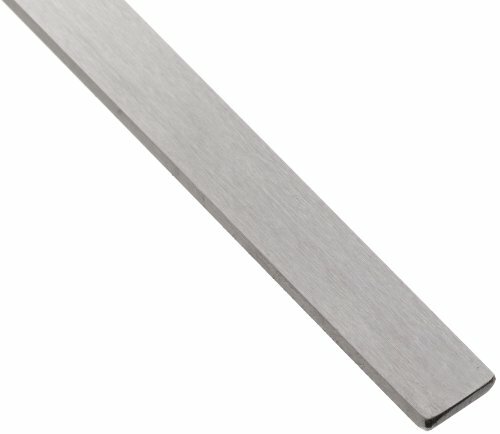 The 1018 carbon steel rectangular bar has an unpolished (mill) surface and a standard tolerance. The 1018 carbon steel grade has low carbon content for a balance of strength, machinability, formability, and weldability. This material can be heat treated for higher hardness. The 1018 carbon steel rectangular bar has been cold rolled, has an unpolished (mill) surface, meets American Society for Testing and Materials International ASTM A108 specifications, and has a standard tolerance. The 1018 carbon steel grade has low carbon content for a balance of strength, machinability, formability, and weldability. This material can be heat treated for higher hardness. The bar has been cold rolled, a method of compressing metal between two rollers below the material's recrystallization temperature to achieve the specified dimensions.